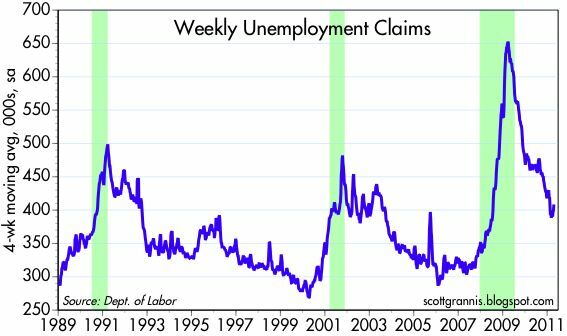 I wasn't going to post on this subject today, but then I saw comments to the effect that today's jobless claims numbers were "ugly." I think it's hard to look at this chart and find anything ugly about it. To be sure, claims have ticked up in recent weeks, but that sort of volatility comes with the territory. Plus, nonseasonally claims (actual claims) have been flat for the past two months; the seasonally adjusted number has risen because actual claims haven't fallen as they typically do at this time of the year. 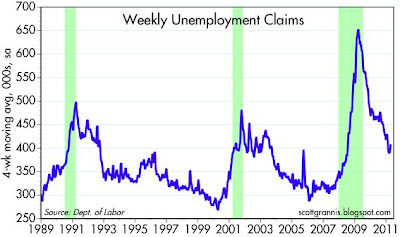 The "ugliness" of the jobs numbers could be simply a seasonal adjustment artifact. 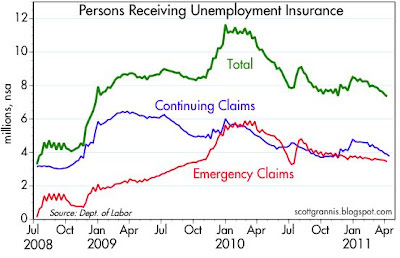 And consider this chart: the number of people receiving unemployment insurance has been steadily decreasing all year. Continuing claims for unemployment have in fact declined by slightly more than 1 million year to date. Undoubtedly, some of those people are now without jobs and without insurance, but it's equally true that even more are now likely working. After all, payrolls have been increasing for over a year. The jobs market is slowly improving; while it may be disappointingly slow progress, it is far from ugly. Being the ultimate skeptic - I'd say that today's 'adjusted' numbers are simply 'support measures' for the ongoing 'pre-election' ultra loose Fed monetary policy. Excellent point. A third option exists: entered the subterranean economy. The political freeloaders should try a few years of unemployment. It would be good for them!